When entering the baseball parking lot, this is the field to the far left. Take Rte 40 East. Follow 40 East for several miles and turn left onto Cow Pond Brook Rd. The baseball fields are down the first dirt road past the 4-way stop. Turn left on Groton St. off of Rte 113 by the Exxon Gas Station. At fork in road, turn left onto Hall St. Stay on Hall St. until you come to a fork, and bare right onto Old Dunstable Rd. Stay on Old Dunstable Rd. until you come to Hoyts Wharf Rd. Turn left onto Hoyts Wharf Rd., and stay on Hoyts Wharf Rd until you come to a stop sign. Turn left at the stop sign onto Cow Pond Brook Rd. Cow Pond Fields will be on your left. This is the middle field in front of the batting cages and snack shack. This is the field to the farthest right with home plate facing the parking lot. It does not have a formal fence. From Rte 119 take Rte 225 West. Stay on 225 until you come to the West Groton intersection (near Rivercourt Residences). Go through intersection, pass corner store on the right, bear right onto Townsend Rd. Follow Townsend road for approximately one mile. Cutler field is set back from the road on the left. Cutler 2 is the far field. Take Route 2 to I-495 North. Take Exit 31 (Rte 119) off of I-495. Head west on Rte 119 towards Groton; this will be a right turn off of I-495 if coming from the south, a left if coming from the north. Continue on Rte 119 until you reach the lights at the intersection of Routes 119 and 225 (near Shaw's Plaza). Turn right onto Rte 225 East, toward Westford. Stonebridge Field is 0.4 miles down the road on the right. The Groton Town field is located directly behind the Groton Library off of Rte 119, in Groton Center. 119 is Exit 31 off of Rte 495. Go 119 West toward Groton. 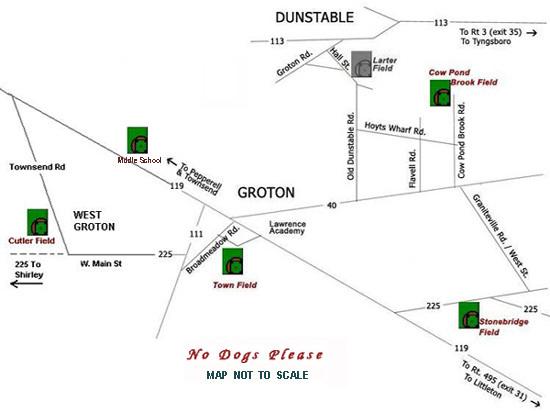 The Groton Library is approximately 7 miles from Exit 31 off of Rte 495, and 3.2 miles from Shaw’s Supermarket at the intersection of Routes 119 and 225.